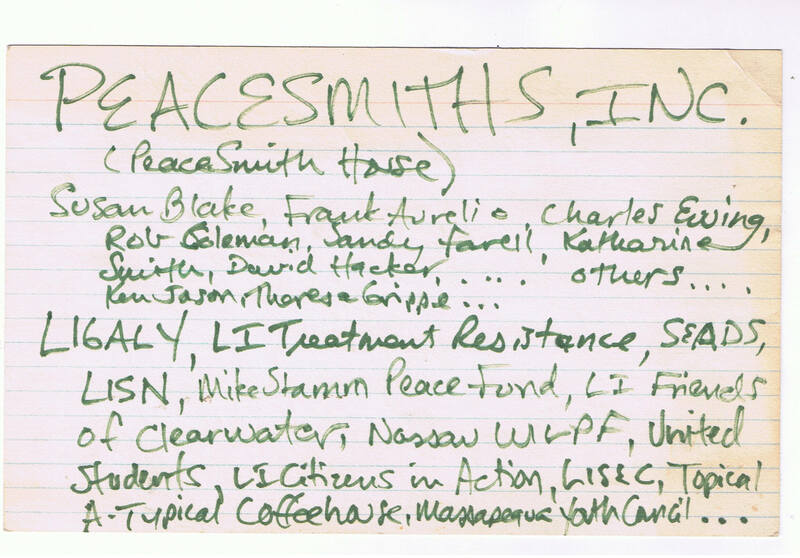 PeaceSmiths was founded in 1972. PeaceSmiths is involved in community organizing for peace and justice. We do projects related to education, activism, culture and mutual help. PeaceSmiths, Inc. is a non-profit, tax-exempt organization. PeaceSmiths is a non-profit, membership organization. Kimberly Wilder is the Volunteer Communications Coordinator. PeaceSmiths runs a hotline for activists, at phone number: (631) 798-0778. FAQ on Vegetarianism: (See post with more info: here). Many of our members or attendees are vegetarian or vegan. So, we strive to serve vegetarian dishes, with at least some vegan choices, at our events. The PeaceSmiths, Inc. web-site is a new experiment. We have decided to keep the comments opened up for sharing and reflection. Though, we do review comments before posting. At this time, our policy is to not advertise events that are not PeaceSmiths-related activities. We are also very careful about where we link, and we do ask you to use your own judgment and care in following links from this site (we can’t be responsible for outside links.) We accept comments which: are related to PeaceSmiths issues or events; do not contain hate-messages; do not promote non-PeaceSmiths related activities; link to PeaceSmiths-related websites. Thanks. Please submit calendar items or links via e-mail for review to: peacesmiths@yahoo.com. peacesmiths at yahoo dot com. PeaceSmiths, Inc. is sharing some items our artists created, and some from other organizations that we are not claiming a copyright to. We consider posting here to be fair use for the educational purposes of our non-profit organization. Please contact the original artist or copyright holder if you would like to reproduce. Please contact PeaceSmiths, Inc. about using our artwork.